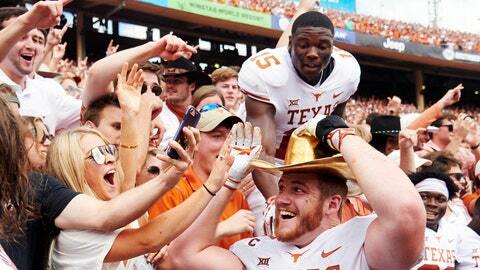 ARLINGTON, Texas (AP) — Texas players celebrated on the field at the State Fair of Texas, flashing “Hook ‘Em Horns” signs and posing for pictures with the “Golden Hat” trophy that goes to the winner of their Red River rivalry against Oklahoma. Soon after leaving the field, though, the Longhorns were already thinking about the possibility of another meeting this season against the three-time defending Big 12 champion Sooners — for a different trophy in a different location. Eight weeks after Texas won 48-45, they do meet again. Fifth-ranked Oklahoma (11-1, 8-1 Big 12, No. 5 CFP) plays the ninth-ranked Longhorns (9-3, 7-2, No. 14 CFP) in the Big 12 championship game Saturday. For the Sooners, this unusual rematch is about more than avenging its only loss. They can become the first Power Five team since Florida in the mid-1990s to win four consecutive outright conference championships, and a win could get them into the College Football Playoff for the third time. “It’s one of the greatest rivalries in college football, but this week is about winning a championship and that’s what we’re focused on,” said Oklahoma linebacker Kenneth Murray, no relation to the Sooners’ Heisman Trophy-contending quarterback Kyler Murray. This is only the third time in the series that started in 1900 that the bitter border state rivalry will be played twice in the same season. The last time was 115 years ago. Every game in the series since 1929 has been played near the midway at the State Fair of Texas. The Big 12 title game will be about 20 miles away at AT&T Stadium, the home of the NFL’s Dallas Cowboys where the Sooners could play again if they make the playoff. That is also the home of the Cotton Bowl, one of the national semifinal games Dec. 29. To win their first Big 12 title since 2009 , the Longhorns have to beat their biggest rival for the second time. Oklahoma dual-threat quarterback Kyler Murray has his title shot after first going to Texas A&M, then transferring to Oklahoma. He had to redshirt a year before backing up Heisman Trophy-winning quarterback Baker Mayfield last year. “Sitting for as long as I have, just hoping that I had the opportunity to do what I’m doing right now, I think it’s all been worth it,” Murray said. A first-round MLB draft pick last summer, Murray is the first FBS player to finish the regular season averaging at least 300 yards passing and 60 yards rushing. His 4,527 total yards are more than about one-third of FBS teams, including four Top 25 teams. Texas quarterback Sam Ehlinger hurt his shoulder Oct. 13 against Baylor, and took a shot just before halftime Nov. 17 against Iowa State that knocked him out of that game. Ehlinger has 2,774 yards passing and 23 TDs, plus 11 rushing scores. He set a Big 12 record with 308 consecutive passes without an interception before two last week at Kansas, his first picks since the opener. Both teams had more than 500 total yards, and both quarterbacks accounting for five touchdowns in the Oct. 6 game that was the highest-scoring of the 113-game series. Murray led to Sooners to 21 points in a six-minute span late to tie the game before Ehlinger had one of his late game-deciding drives — leading to a field goal. The Sooners have allowed 449 yards per game this season — on pace for a school record. They’ve allowed at least 40 points in each of their last four games, all wins — three of those are by a combined nine points. … In 2015, Oklahoma lost to Texas in the regular season and went on to the reach the playoff. … The last five games between Texas and Oklahoma have been decided by a combined 25 points — five points a game.